Ryan Goodfellow celebrates after his penalty heroics at the weekend. Picture by George McLuskie. Ryan Goodfellow insists there will be no stopping the Fifers this season and says the squad can’t wait to get league business started. The Fifers head into their first fixture of the 2015/16 campaign on Saturday when they travel to East Stirlingshire. 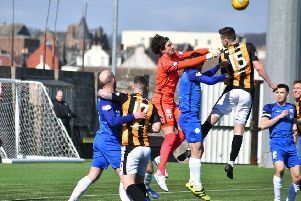 Goodfellow played his part at the weekend as East Fife ensured they wouldn’t be dumped out of two cup competitions in as many weeks when his penalty shoot-out heroics helped them see off Dumbarton. And now it’s down to the nitty gritty of a new league campaign, with the ex-Dunfermline ‘keeper saying the squad is well up for a promotion push. “it’s a big game for us on Saturday,” said Goodfellow. “We’re an ambitious team and we’re looking to go and win. East Fife looked to be heading out of the League Cup on Saturday with Dumbarton having two spot kicks to seal the tie. But they couldn’t find a way past Goodfellow and in the end his save from Kevin Cawley’s penalty made sure East Fife were in the hat for Monday’s draw. The tension was a new experience for the goalie, but one he savoured. “It was my first ever penalty shoot-out and I loved it,” he said. “At a time it was looking difficult for us but then one of their boys put it over the bar and we had a chance again. The draw for the second round of the League Cup was made on Monday afternoon and East Fife will play host to Motherwell from the Premiership.